So... apparently I'm supposed to introduce myself. 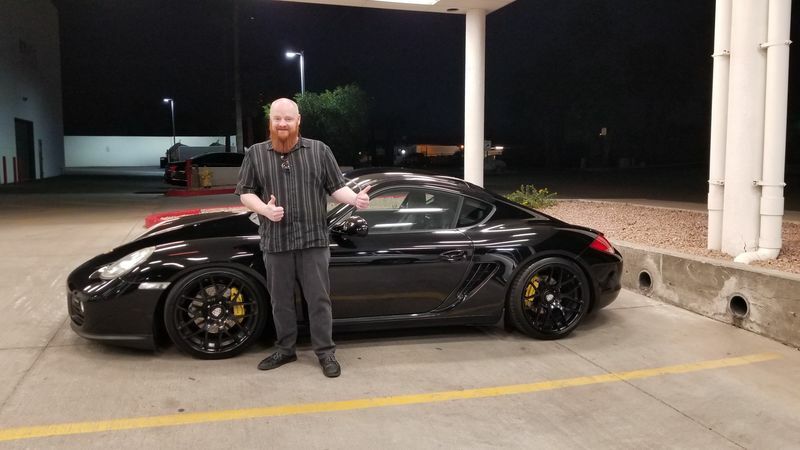 The name is Don and this is my first Porsche. Before this I've had (and still have...) an old Mach-1 Mustang, a Sonoma GT and a Ford Escape along with an '82 FXSB, a Buell XB12R and an EBR 1190RX. Anyway... the Porsche seems pretty cool so far. I've just driven it from PHX to Prescott and then over the mountain on 89 to Jerome but it seems quite fun, so... I can't imagine my impression changing too much . I'm used to motorcycles so it's certainly a little pokey compared to those but... That's to be expected for sure. So yeah... that's done . Thanks for keeping this forum running admins . well done man. steveox on this forum will be jealous - he's been in the market for one for a few months now. Yeah... Well put on the beard and all that but the plan is to add tint so people can't see me. I don't like being the center of attention. They can look at the car all they want, but... I'd rather not be a part of all that . I just like cars. That said... Anyone know where I can get some yellow headlight covers? I generally wouldn't go that route I think but it already has yellow calipers so... Why not? Yes 19"... It's a little harsh maybe but the suspenders are pretty stiff anyway, so... I'm OK with it for now . Maybe I'll think differently when the used car smell wears off . Nice looking car and a 2009 is a fine choice. She has clearly been modded and lowered so I would find a good Porsche Indy shop do a good once-over PPI so you know what all has been done along with any recommendations. I personally want to know all the dirty details because I don't much like surprises. I'll get to it for sure... I little scary to be honest as I've already bought it but yeah... Needs to be done. Maybe we won't find that its been at 7500RPM for 30 minutes . Maybe. I did look under it last night and it does have an aftermarket exhaust of some kind. What's the best way to tell if it also has a non-factory tune? I know a guy selling a "Durametric" I think it's called. I'm headed to the dealership this weekend to take care of a couple little things... Will they generally be OK with giving me a full diagnostic report while they have it hooked up or is there some P-Tax on that? Never found a shop anywhere that offers a full diagnostic report for free. Maybe yours is different. A PPI is typically $200-$300 and they look over everything including software, rev count, suspension etc. Well worth the price IMO so you have a good baseline on the car. How do you.like it so far? That said ... the engine light came on today. I called the dealership and I've already got an appt for Saturday so the tech said it seemed fine to drive as it sounded fine. Nothing major/mechanical... And I bought the warranty etc, etc... They seem to have a good return/exchange policy so... We'll see how it goes. As far as the car minus that... Effing excellent.